On The Road To Salvation… a mobile confessional! This is very cool. Fr. Z kudos to the one who came up with this. From KATC TV in the Diocese of Lafayette. 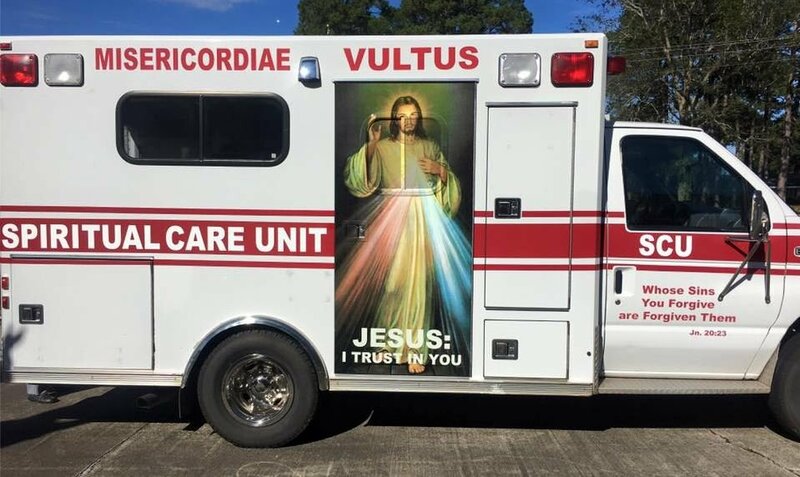 Someone converted an ambulance into a mobile confessional. Be sure to watch the video. The Lafayette Diocese has created a new and easier way for outreach with the Catholic Church. They’ve converted an old ambulance into a mobile confessional called a spiritual care unit. With a picture of Jesus and Bible verses on the side, the new unit is for spiritual emergencies, specifically remodeled for prayer and confessions. “It’s a way that we can give some pride and public expression of our Catholic faith that is not just meant for the walls of the church, but on the streets,” Father Michael Champagne, a priest at Lafayette Diocese, said. The unit is part of Pope Francis’ Year of Mercy that begins on December 8. Thanks to an anonymous donation, it took two weeks to complete the unit that Champagne calls a church on wheels. “We need to go to where people are. People come to the church as a center of worship and pray, but we also have to do outreach,” Champagne said. Not only is the vehicle a way to bring more people to the Catholic church, but it makes going to confession easier for people with busy schedules. “Pope Francis is asking us to go out of to the peripheries of the church and now we have the means to do that,” Bishop Michael Jarrell said. Inside the unit there are Bibles, rosaries and even holy water. It’s fully equipped to spiritually care for others. The spiritual care unit will make stops around Acadiana beginning on December 8, for the beginning for the holy year of mercy. I can see racing about… lights flashing… dashing to hear confessions as the rest of the team piles out to stop liturgical abuses! And now…. GO TO CONFESSION! This entry was posted in Fr. Z KUDOS, GO TO CONFESSION, Just Too Cool, Lighter fare and tagged ambulance, confession, sacrament of penance. Bookmark the permalink. 14 Responses to On The Road To Salvation… a mobile confessional! This is great, especially for those who are home bound and cannot walk or drive to a Church. Hopefully it plays “All are Welcome” as it rolls through the neighborhood. Here’s an idea: The USCCB should use the money they collect for the Campaign for Human Development and buy each diocese one of these spiritual ambulances for use during the Year of Mercy! The Diocese of Lafayette is to be commended for such a forward-thinking, Spiritually-nourishing, endeavour such as this. Now that is creative thinking! Good to have a confessional that’s both spacious and safely lit. Recently I was in an exceptionally dark and rather tight confessional. I’m a big fellow and my eyesight isn’t the best, so I ended up knocking over the framed act of contrition that was on the wall. Oops. I nearly said “bless me father, for I am an oaf”, but I thought better of that and used the standard opening. This can be driven to the perifery. Not a fan of the Divine Mercy graphic, but neither was Sr Faustina. The confessional idea is good. May I suggest parking one outside strip clubs, seedy bars, and Planned Parenthoods.